My-Tyme® can make in your life. Don't have time? Now you will. By setting priorities and planning in advance, you'll begin to see opportunities develop into more time for yourself and what you really want to achieve. My-Tyme® makes it easy! Every tool you'll need is at your fingertips. 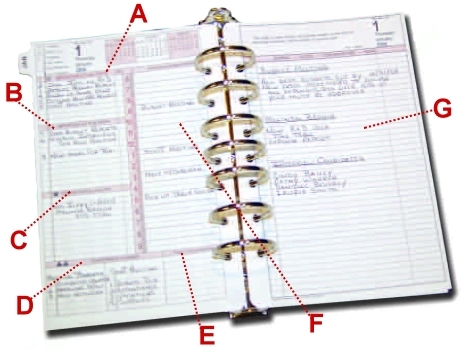 Utilizing a sophisticated calendar system with goal planning and tracking sheets – even delegation tools – My-Tyme® organizes your life while you plan your future. 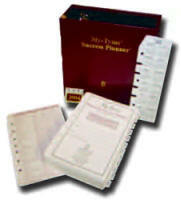 The My-Tyme Success Planner makes it easy to plan your day and achieve your goals by using these powerful tools. Imperative Action Steps: Prioritize the urgent action steps that are significant and time sensitive for you to achieve your goals. Important Action Steps: List the action steps that are not urgent, but important because they would make a contribution toward achievement of your goals. Contacts/ Follow-ups: Group together all your calls abd designate a time to make them. Commitments/Appointments: Schedule all your daily appointments and commitments here. Conference Planner: Record the names and topics you wish to discuss with various people. Today's Accomplishments: List the progress you are making toward your goals. Notes: A page for notes is opposite each daily page. 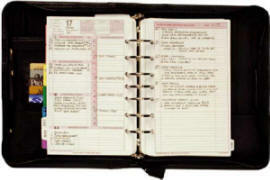 Each My-Tyme System includes a two-page monthly planner. Begin each month by scheduling blocks of time to focus on the activities that help you accomplish important goals and priorities. Also schedule blocks of time for appointments, commitments, travel time, and important dates. 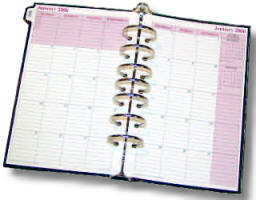 The monthly calendar allows enough space to record up to eight scheduled appointments each day. By scheduling and planning in advance, you begin to see more time available for yourself and others. Choose the starting month of your set. Begin now! Do not wait for the new year to roll around to start setting goals, planning, and organizing your time. 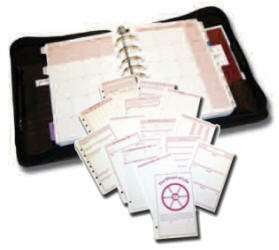 Your planner can be ordered to begin any month you choose. Choose your binder. 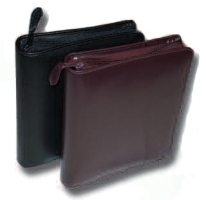 Choose from three binder styles: full-grain leather with zipper, prima vinyl with zipper, and padded vinyl. 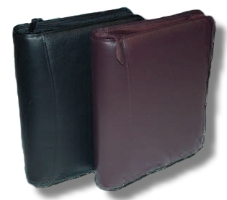 Each binder style is offered in either black or burgundy. Be sure to indicate start month on Order Form. Make sure you have everything you need to plan and focus on another year. 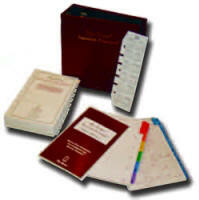 This can be ordered with or without the Storage Binder. Simulated leather creates the look and feel of real leather. This binder features zipper closure, two inside pockets, two pen loops, one business card pocket, concealed rivets, rounded corners, and seven 1 1/2" rings. Available in Black. Fill out the Request for Prices and Order Form Form. With this investment, you'll soon learn that what you gain from My-Tyme® is indeed priceless.